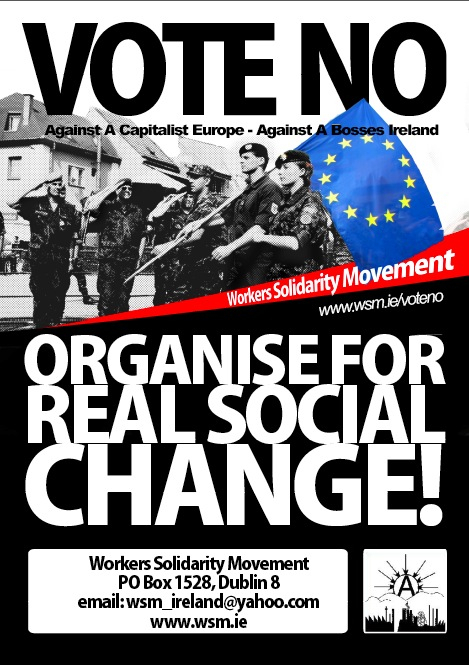 The Workers Solidarity Movement is calling for a No vote in the Lisbon referendum. It is a treaty for the rich, people in Ireland can do a lot better than a choice between the clowns in the Dáil or those in Brussels. We oppose the EU's policies of privatisation, militarisation and attacks on workers' conditions but don’t insult people’s intelligence by saying that our current society in Ireland with its severe recession, diabolical public services and corruption is anything better. The major lack of democracy in our lives is not between us and the EU but between the Irish government and us. The upcoming Lisbon vote is one of the rare occasions that the people get a direct say. But it’s only a very limited say. We get to choose between either a gombeen republic or an embryonic European state, neither of which makes for an exciting prospect. Whichever way the vote goes, there is no indication that either a yes or a no vote will substantially alter the exclusion of the public from major public decisions. That requires a rethinking of the kind of society we want. The problem is not the treaty alone but the EU as an institution.We call on people to Vote No to Lisbon but also to organise to take more control of our lives and to build real democracy in our communities and our workplaces. The Workers Solidarity Movement will be campaigning for a 'No' vote in the upcoming referendum on the Lisbon Treaty. Lisbon and Democracy - Do We Really Have a Say? It's the time of year where we plebs get a chance to rectify our impertinence in rejecting the Lisbon Treaty. In itself, rerunning the referendum is hardly an affront to democracy. After all, people are simply being asked to confirm the decision made. One of the great problems that people encounter in making up their minds about the Lisbon treaty is that, depending on who you talk to, the treaty can appear to be an altogether different thing. According to those who are campaigning for a Yes vote, it merely serves to tidy up the existing European treaties, with a few changes to allow the EU to function more efficiently. explaining how this treaty is written for and by elites and arguing for a social europe. Imagine that, leaving the pub on Saturday night, you find a fight outside. The Gardai turn up, grab a load of people, including you, and drag you off to the station, and throw in a beating in the back of the van. Next morning you are taken to an interview room and an old garda gives you a cup of tea, apologises for the "mix-up" earlier and says you can go as soon as you've signed a 6 page statement he's prepared for you. Libertas: US Military Contractors Against Lisbon! A closer look at Declan Ganley's "Libertas" campaign - the figures behind it and their motivations. On Sunday April 20th 2008, Libertas announced that Ulick McEvaddy was "joining the No To Lisbon Campaign" and publicised the event with a photo-opportunity of the two 'entrepreneurs' in front of the Libertas Campaign bus. McEvaddy is the first member of the Irish business and political elite to join the Libertas campaign since it emerged under the stewardship of Declan Ganley. A number of weeks ago, a member of the INTO (Irish National Teachers Organisation) submitted a letter for publication in the union magazine 'In Touch'. This was in response to a request in the previous issue of the magazine for members to write letters for publication. Will the Lisbon Treaty vote change anything? Last year, the EU Constitution was defeated in referenda in France and the Netherlands. Europe's governments quickly got together and rewrote the constitution as an incredibly complicated list of amendments to existing treaties. Together these amendments make up the "Treaty of Lisbon" Valery Giscard d'Estaing, the president of the Convention on the Future of Europe which did much of the ground work in drafting the constitution, has concluded that "the difference between the original Constitution and the present Lisbon Treaty is one of approach, rather than content". 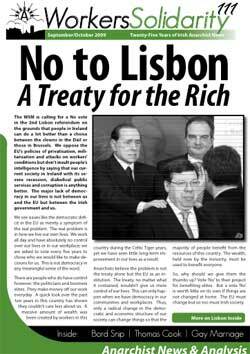 The Workers Solidarity Movement welcomes the rejection of the Lisbon Treaty. This treaty dealt with structural changes in the EU and as such no matter what it contained could not give us more control over our lives. This can only happen when we have democracy in our workplaces and communities. With a large number of conflicting interpretations in circulation, many voters' voting decisions depended on whom they trusted the most. When it came down to it, the side that was represented by politicians and IBEC was always going to be in trouble. 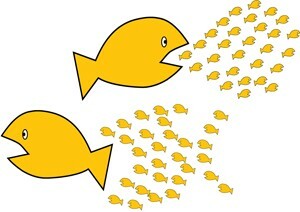 In the end, the loyalty test split the electorate on class lines. The wealthier constituencies trusted their politicians and business leaders more, the rest of the country sided against them and with the left or the nationalists. As the morning of Friday 13th of June grew towards midday, the government watched and ... realised with mounting horror that they had not only lost the referendum for the Lisbon treaty, but had lost badly. In the end, with a turnout higher than both Nice referendums and European elections, the Irish electorate had cast more No votes, than the number that elected the FF government last year. The NO victory in Ireland is a clear demonstration of the lack of support among the people for the European project being promoted by the Brussels technocrats and the transnational corporations grouped together in the capitalist cartel, the European Round Table of Industrialists (ERT). This rejection by the country with the highest levels of approval and popularity for the EU shows that a different form of European unity is needed, a real unity of all the people. And the gap between public opinion and their "representatives" is a clear sign of the crisis in representative democracy and the need for direct democracy.